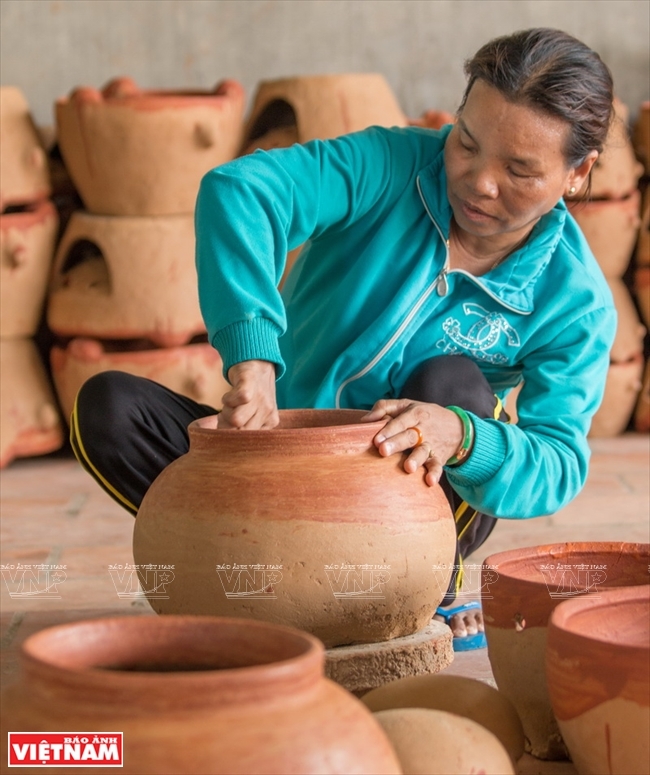 Binh Duc pottery village of the Cham in Binh Thuan province is known in the south of Vietnam for its gorgeous handicrafts made from a special clay. 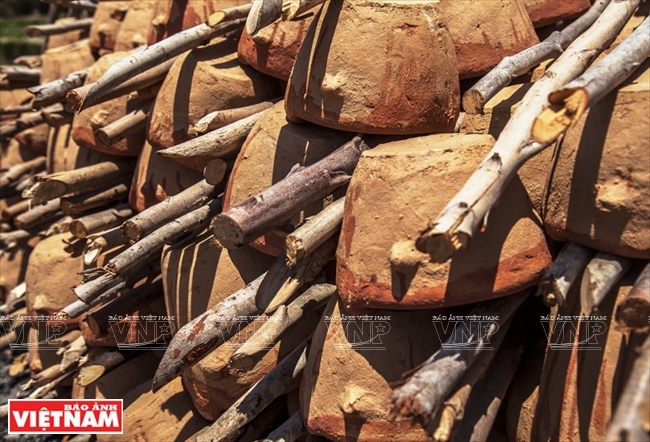 The pottery products made by Binh Duc villagers in Phan Hiep commune, Bac Binh district, are often called Go (which means ‘pot’ in the Cham language) to distinguish them from the other pottery items in Vietnam. 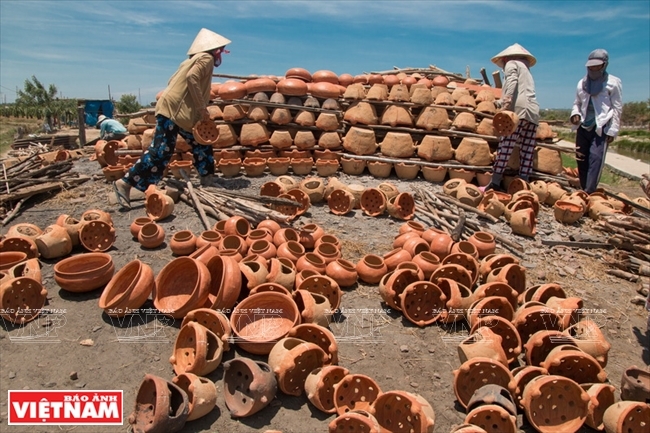 That’s why Binh Duc is also known as Go pottery village. We dropped by the home of 55-year-old Lam Hung Soi who has over 30 years’ experience working with pottery. Soi’s wife, Nguyen Thi Minh, 53, was making new products on a turntable while her daughter was kneading clay. 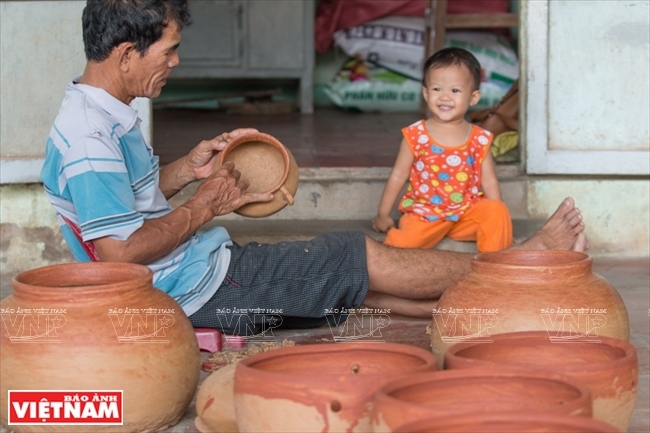 Soi, who learned the trade from his mother, said that Go pottery products are different from Bau Truc products in Ninh Thuan province as they are made from two different kinds of clay. 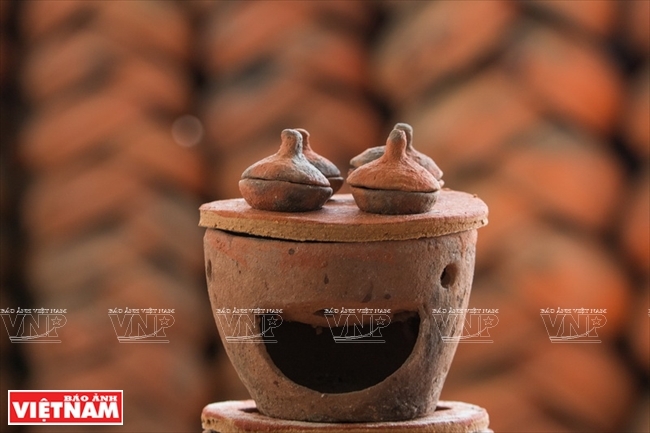 Bau Truc pottery products, made from clay in the fields, are darker while Go pottery, made from clay in the river, has a natural light reddish color. 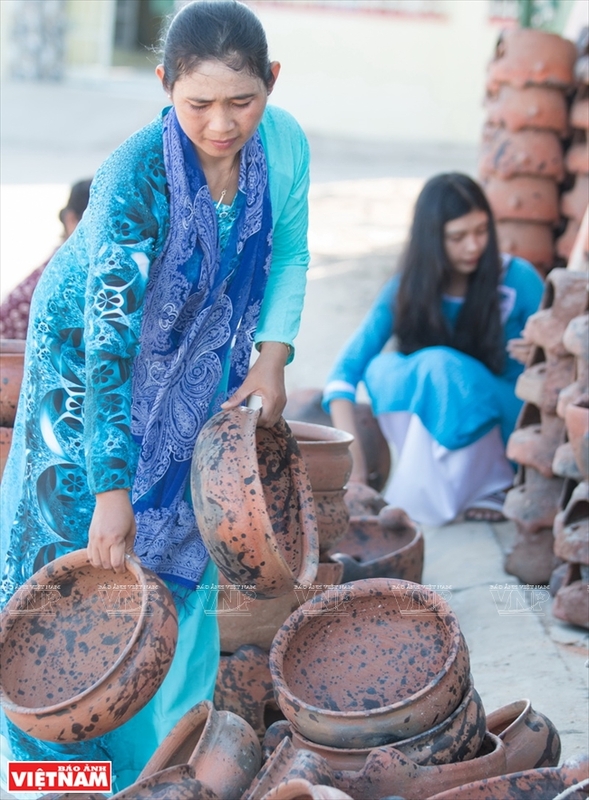 Nguyen Thi Minh checks on the newly shaped pottery. 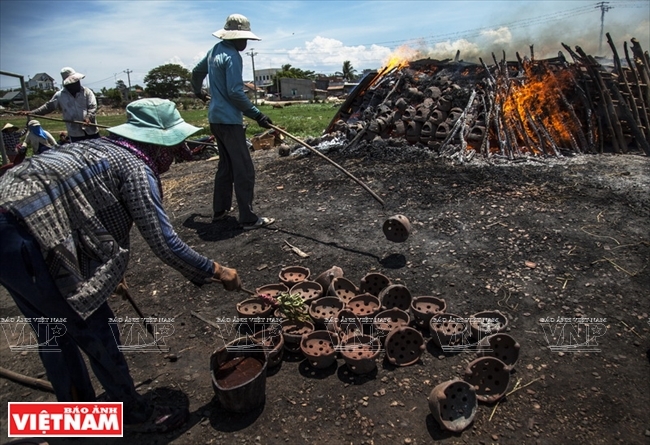 Lam Hung Soi examines the pottery before firing. Making the pottery surface smooth. 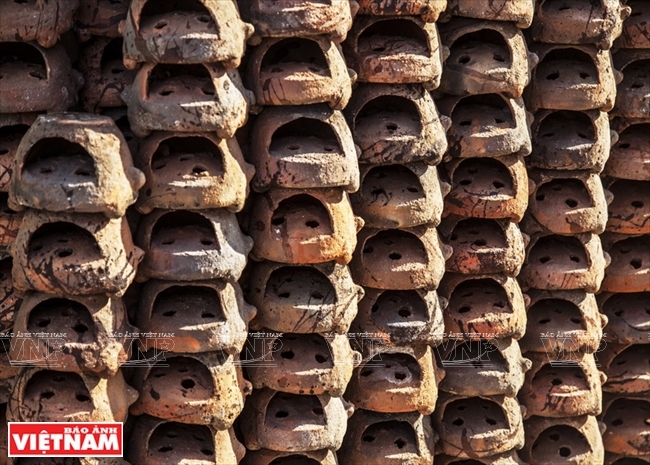 Many Cham women in Binh Duc village make pottery. The pottery has a light red color with special and natural patterns after being fired. Binh Duc pottery has a natural color. An oven and cooking tools. 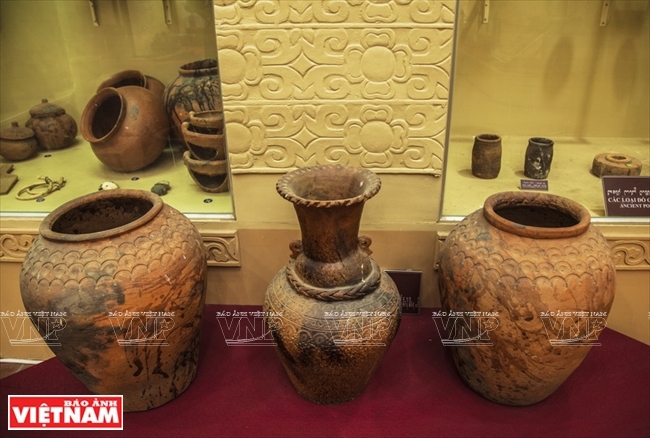 Go pottery products displayed at the Cham Culture Exhibition Center in Binh Thuan province. 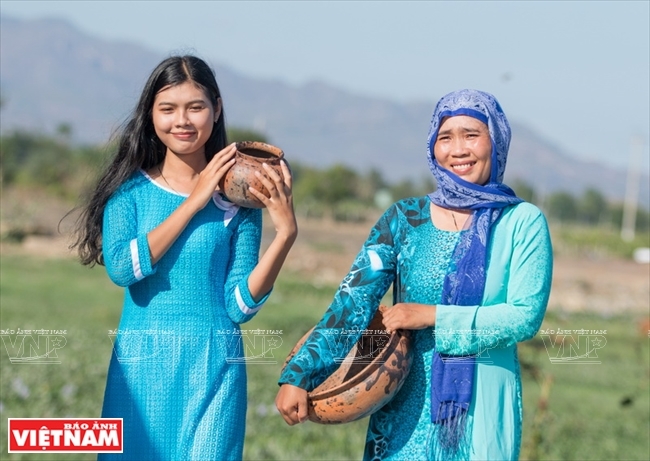 Cham women and Go pottery. The pottery materials including clay and sand are taken through many stages: soaking, mixing with sand and kneading to make the clay soft with a high adhesion. Minh, who spent 40 years making pottery, can make products without any frame. Each day, Soi’s family can make up to 100 items including cooking tools and household items. 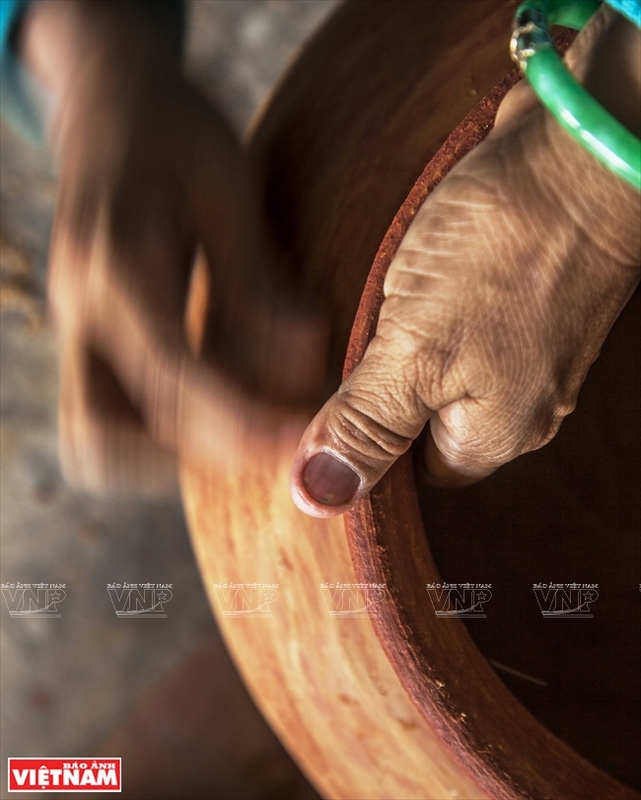 When we visited Tien Thi Loan in Binh Duc village, her family members were kneading clay. After the shaping stage, the fixed products were taken to the front-yard to dry under the sun before the heating process. 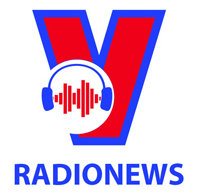 Loan has to hire four female workers because of the heavy workload. The next day, the pottery was dried on the village mound. 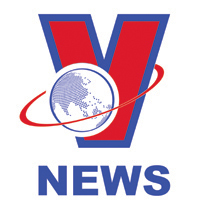 1,000 products made by Loan’s family and two other families were arranged carefully. All products were marked with symbols for verification so that after firing, the craftspeople can recognize their products. 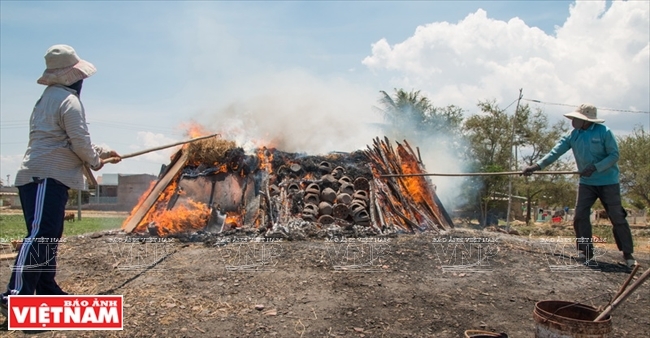 The Cham often collect pottery in large quantities to fire together. Products are often dried on the village mound. Wood is wrapped around pottery products, with a layer of pottery alternating with a layer of wood. Pottery products are fired in large quantities. 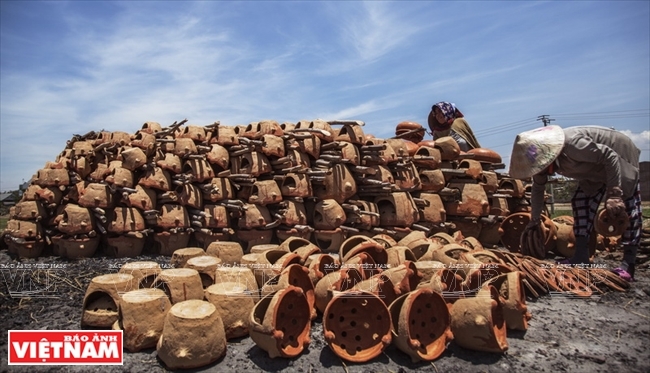 Pottery makers take advantage of the wind to fire their products. While the products are still hot, the craftsmen sprinkle a liquid made from sandbox fruit and golden-apple fruit. The time of firing depends on the size of the product. It takes one hour for a small pottery item and two or three hours for a bigger one. To create special patterns on new pottery products, the craftsmen sprinkle a special liquid on the surface which is made from sandbox fruit and golden-apple fruit. 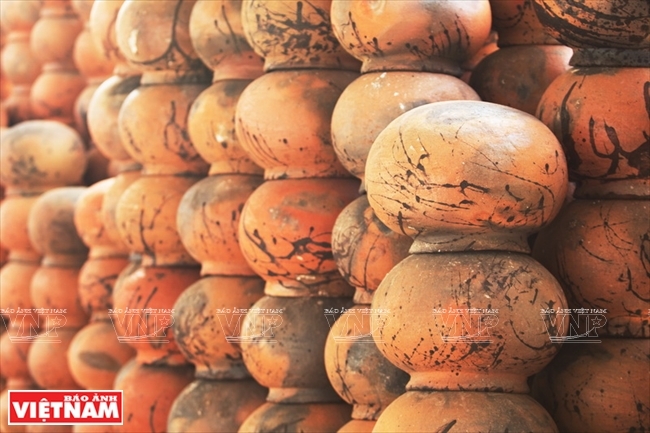 That is why Binh Duc pottery items have the light red color with special and natural patterns, making them distinctive from the items made by other villages.